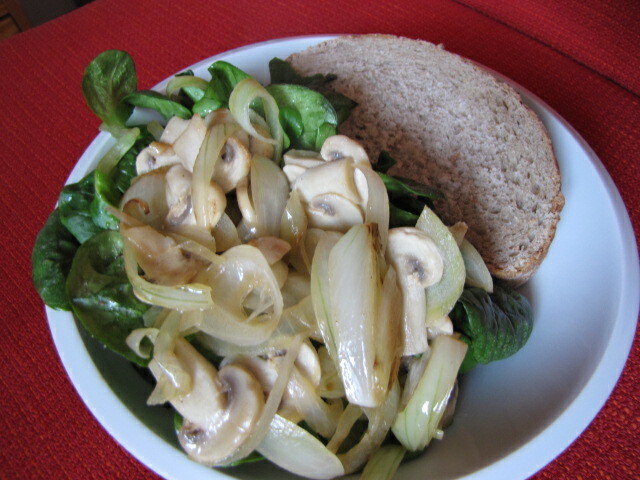 This mushroom mix is delicious and easy and makes lettuce go from blah to WOW. Alternatively, serve it with sliced baguette as an easy appetizer. Or eat it alone, directly out of the pan, with chopsticks. Being a normal member of society, I’ve obviously never done that. Serves 1, if you’re topping a salad. Serves 3-4 as a light appetizer. Saute the onion in butter until translucent. Add in the mushroom slices and cook for about a minute. When the pan is a bit dry, add in a bit of white wine, enough to thinly cover the bottom of the pan. Season with salt and pepper and cook until almost all of the white wine has cooked off, about 3-5 minutes. The mushrooms should be tender, but not droopy and overcooked. I put this on top of lamb’s lettuce (a.k.a. corn salad) dressed with a bit of olive oil and salt and I was one happy camper. I think it would work well with butter lettuce or even something more robust and spicy, like field greens and radicchio. Or straight out of the pan. With chopsticks. Just a suggestion. My name is Bryce. And yes, I do like rice. Thank you for asking. This entry was posted in Appetizers, Mains and tagged appetizer, baguette, butter, butter lettuce, corn salad, easy, field greens, mix, mushroom, mushroom slices, onion, salad. Bookmark the permalink.